Do you know how much revenue your marketing efforts are leaving on the table?Restoration Hardware sits at number 52 on Internet Retailer’s Top 1000 list of eCommerce sites, with 2015 web sales totaling around $900M. It's one of only a handful of furniture stores to make the top 75 slots. Online sales like this are not possible without a savvy digital strategy, and continuous leverage of new marketing channels, both on and offline. Right now, one of the fastest growing digital channels is blogging sites. More brands than ever before are figuring out ways of leveraging the influence (and audience) of blogs to drive traffic and revenue. Restoration Hardware: Raising the Bar On Leveraging Blogs to Drive Traffic and Revenue from DemandJump, Inc.
We all know how the customer path to purchase has changed. Consumers are more empowered than ever before, armed with most of the information they could ever need before stepping up to officially fork over the dough. What's more, our consumers are so pummeled with interruptive marketing, many have been conditioned to simply tune out any messaging thrown their way. This is where blog sites and influencers play a huge role. By syndicating content, links, and advertisements, to the right blogs, brands like Restoration Hardware are capitalising on a hungry audience in a big way. Whether paid or earned, savvy brands are figuring out ways to leverage blogs as traffic and revenue generating machines. Here are three specific blog sites that Restoration Hardware is using to win big. ApartmentTherapy.com is a popular blog helping to educate readers on home and design tips, particularly in smaller spaces. Restoration Hardware receives almost half a million visitors from ApartmentTherapy.com every year. 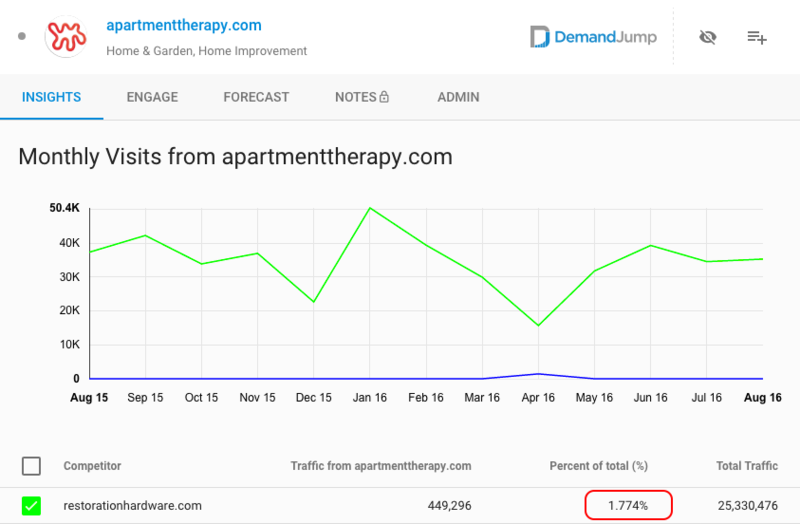 More than the traffic value alone, ApartmentTherapy.com accounts for about 1.75% of Restoration Hardware's total web traffic, making them a critical channel in Restoration Hardware's overall traffic strategy. Based on average order size and conversion rates, those visitors probably accounted for more than $6M worth of revenue. If you're in home furnishings, decor, or any other business chasing a similar audience, ApartmentTherapy.com should absolutely be on your radar as possible partner channel. Houzz.com is a platform built to bring homeowners and home professionals together in a "uniquely visual community". Think home design and decor blog meets Pinterest. Houzz.com is a major traffic driver for furniture retailers, including IKEA, Pottery Barn, Crate and Barrel, and Restoration Hardware. Ever year Restoration Hardware receives close to 150K visitors (.6% of their total annual visits) from Houzz, accounting for an estimated $2M in incremental revenue. This is significantly larger than brands like Wayfair (100K visits), Pier 1 Imports (50K visits), and Target (33K visits). 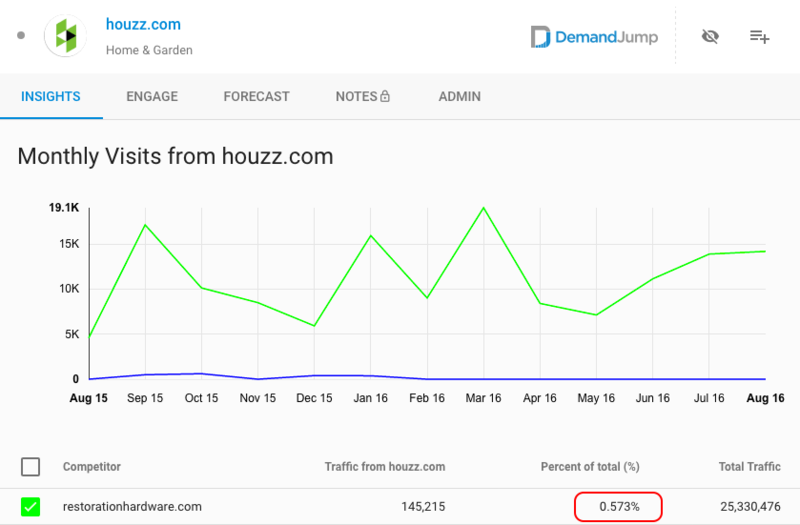 Bed Bath and Beyond, Williams Sonoma, and Kirkland's are several other brands DemandJump's Artificial Intelligence Marketing platform has flagged as underperforming on Houzz. MyDomaine.com is a lifestyle blog covering everything from home decor to career and money advice. The website also features a 'Shop' option, where readers can browse products from various sellers and then be forwarded directly to the seller's product pages. In terms of earned traffic from MyDomaine.com, Restoration Hardware is a top performer in the home furnishings vertical. They earn about 75K visits each year, making up .23% of their total visits (or more than $1M in annual revenue). This is the highest percent of total traffic amongst any competitors analysed during this research. 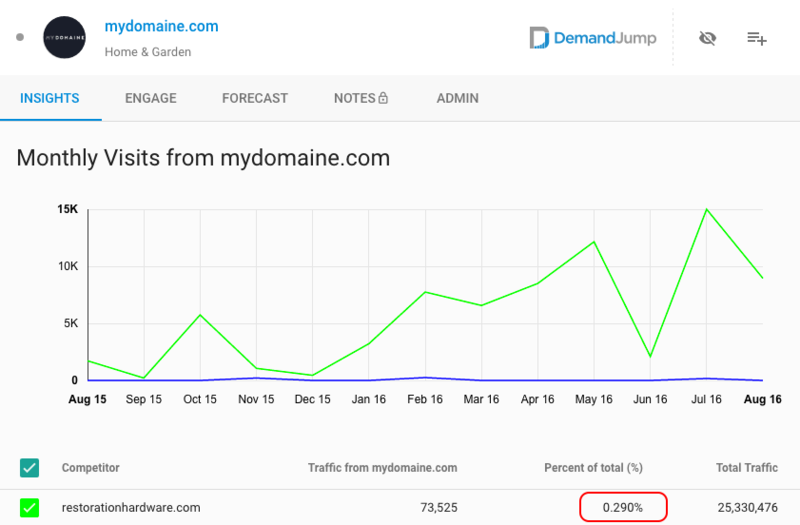 Restoration Hardware also receives more traffic from MyDomaine.com than Wayfair, Pottery Barn, Bed Bath and Beyond, and Pier 1 imports combined. Target, a brand with close to 2B website visits every year, averages only slightly more monthly visitors from MyDomaine.com than Restoration Hardware. Keep in mind that Restoration Hardware receives in the neighbourhood of 25M visits each year. In an increasingly customer-centric business environment, the top brands in the world are figuring out ways to meet their audience in the right place. Retailers like Restoration Hardware are figuring out that blog websites are one of the most effective ways to do this. ApartmentTherapy.com, Houzz.com, and MyDomaine.com are just a few of the blogs Restoration Hardware is leveraging to drive incremental traffic and revenue. Imagine if you knew the next 100? 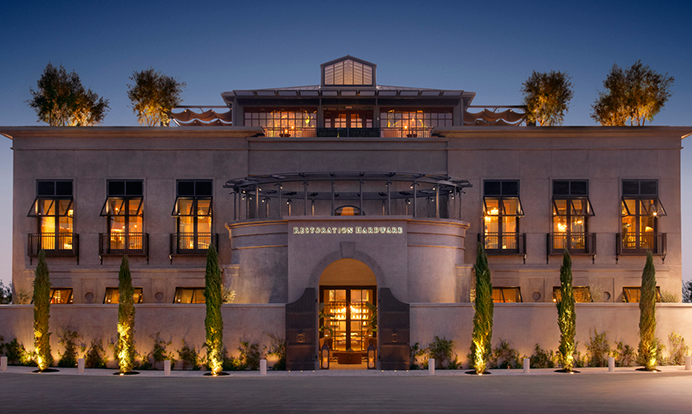 As a constant innovator, competitors can learn a lot from skillful brands like Restoration Hardware. Keep an eye on this retailer, especially as we enter the upcoming holiday season.